2009 has so far been a good year for me regarding sales of my work. It's always interesting to find out who has bought my images, whether they are mounted, mounted and framed, or simply prints on their own. Now and again I find that my work has been sent on to people around the country, who may have once lived here in the North-East and want a little something to remind them of the region. I regularly exhibit my work in the Sunderland Tourist Information Centre. I have had quite a lot of success since my first framed photograph was sold there back in November 2008 and my latest sale has a bit of a story behind it. The photograph above, which is Penshaw Monument At Dusk, was mounted and framed on request before being displayed in the Sunderland Tourist Information Centre and has achieved sales of 10 in the last few months alone. Sat in a 40 inch panoramic frame, the image is quite dramatic and shows Sunderland's most prominent landmark at it's best. The last unit on display was bought as a presentation gift and has found itself a new home - onboard HMS Ocean, the giant Royal Navy helicopter carrier that made a recent visit to Sunderland. The 22,500 tonne amphibious assault vessel docked at Corporation Quay in Hendon and spent a total of four days there. The warship is a sea-going commando base, capable of rapid deployment anywhere in the world. It's nice to know that my work is now being displayed on water as well as land, which is something I never envisaged a short while ago. HMS Ocean must have clocked up thousands of miles since it left Sunderland recently - again, a nice thought that my work is reaching territories that I never imagined. And long may it continue! To view a short article on HMS Ocean's recent visit to Sunderland just click the link below. 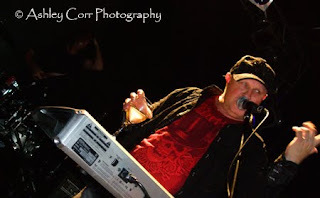 My first 'Live Music' blog entry. It was time to use my compact Fuji camera again - a permanent fixture when it comes to live music concerts. The battery (and spare) had been charged during the day plus I had the luxury of an empty 4gb memory card. Tonight it was 'A Flock Of Seagulls', who started life in the 1980's as part of the New Romantic/ Electronic scene. The venue was the O2 Academy in Newcastle-Upon-Tyne. Quite a few people showed up for this one, although it was by no means a packed house. I went to the Academy with my gig mate 'Billy Bootleg' and got a reality slap at the bar when the young lass charged me £7.20 for two pints of lager!!! Mind you, them Geordies have always been a set of robbing buggers, eh (wink). The gig itself was great. Fifteen songs in total. At £13 a ticket it was a steal. The support act, Billy Blood-Axe, was a bit of a joke though. Never mind, at least he had the balls to get up on that stage...unlike me. He he. It's 5am and I'm traveling from our base at Robin Hood's Bay to the nearby North-Yorkshire town of Whitby. Yes, that's right - 5am !! In my still rather tired state I keep asking myself what the hell am I doing. I mean, I could be tucked up in that nice warm bed, knocking out those zedders, yet here I am on this cold morning in search of a nice sunrise shot over Whitby Harbour. It's always a gamble when you rise early for sunrise photography. I've lost count of the times I've showed up at the crack of dawn, but the sun hasn't. Low cloud on the horizon can often make your efforts a complete waste of time, but striking lucky can make those efforts all the more worthwhile, and that was what I was hoping for. I parked up on West Cliff shortly before sunrise. There wasn't a soul about. It was very quiet, as you would expect. Just the odd seagull calling here and there. A fishing boat left the harbour below my vantage point on the cliff, and in all probability, the crew were in search of those rather nice cod that Whitby is famous for serving up. The sky was fairly clear, and I was hopeful for a few nice shots when the sun finally made an appearance on the horizon. A man and his dog walked by as I set up my tripod - he must have thought I'd lost the plot, taking photographs at this mad hour! But, you've gotta break a couple of rules to get the shots you want, regardless of the time and location. So, I was in position and the sun came up at 5.20am. I snapped away, rattling off a dozen or so frames, before beating a hasty retreat to the car. As I returned to Robin Hood's Bay, a wild deer ran across the road, just missing my car. It jumped over a broken fence and ran off into the distance. Five minutes later I was back in bed and off to sleep. A couple of hours later I was outa bed and in the shower, before being treated to a lovely cup of tea and a massive bacon sandwich, courtesy of my wife. She knows the score...aye, brown sauce anarl!!! 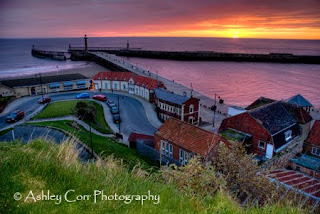 I then reflected on my early rise by checking my 'Whitby Sunrise' shots. I was quite pleased with them. It was well worth the effort.